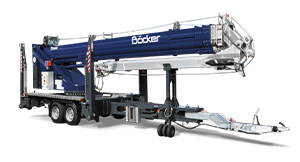 Böcker International - Truck Cranes, Trailer Cranes, Furniture Lifts and Construction Lifts, Personnel and Material Lifts..
Böcker Maschinenwerke GmbH is a traditional German family-owned medium-sized company that produces high-quality products made in Germany. 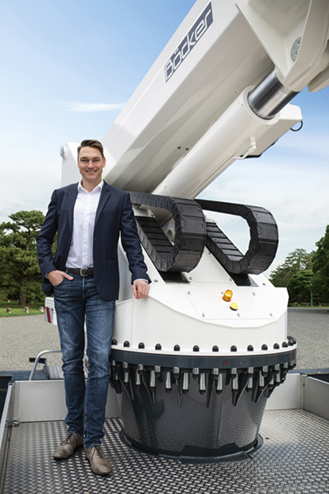 Having grown from a tiny forging business to an international engineering company with a workforce of more than 400 based in the Westphalian town of Werne, our company now has a worldwide presence while still retaining its clear commitment to its German origins. Böcker stands for high-tech, know-how and tradition and responsibility. 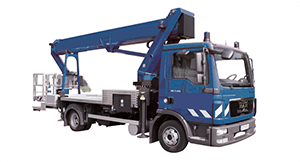 Böcker Maschinenwerke GmbH is one of the world's leading developers and manufacturers of lifting technology. When it comes to technology and quality, our machines are leaders in their markets, a fact that we particularly owe to our highly-qualified and loyal long-standing workforce. We use targeted training measures to encourage and foster the development of our employees, which is just one of the reasons why we are one of the top 100 employers in the SME sector. Begin your journey to the top with Böcker and apply for a job with us today! Since my grandfather Albert Böcker, a master smith, founded Böcker in 1958, we have been constantly working with passion and conviction to develop innovations in the field of lifting technology. 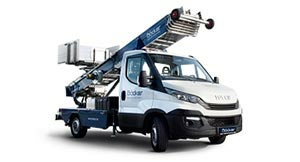 Starting with our inclined construction lift with integrated knee joint for roofers, through to the successful market launch of our first lightweight aluminium mobile truck-mounted crane, to the invention of our aluminium trailer crane, our innovative product developments are guaranteed to deliver you and your loads to lofty heights easily and safely. Our range of rack and pinion hoists and personnel and material lifts round of our extensive and high-quality range of products and pave the way to the top for all types of trades. 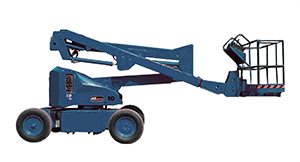 We have been setting new standards in lifting technology time and time again at Böcker for six decades now. Besides being a company which is active on the global stage with a worldwide presence, Böcker is not only known for its high-tech and know how; as a family-owned company with a clear commitment to its Germany origins, we also stand for tradition and a sense of responsibility. When it comes to technology and quality, our machines are leaders in their markets, a fact that we particularly owe to our highly qualified and loyal and long-standing workforce of more than 400 employees. This is why we intend to remain true to our corporate philosophy in future: Be it a customer or an employee, people are at the centre of everything we do at Böcker." To be able to develop our cranes, hoists and lifts on an ongoing basis, we not only observe the latest technical developments in the market, but also enter into close communication with representatives from a wide variety of industry sectors, including roofers and carpenters. We do this because we can only develop construction cranes and hoists that not only meet the expectations of our customers, but actually surpass them, if we know the specific needs of the trade and industry. With some success apparently, because our customers consider us to be the leader in quality and innovation in the field of lifting technology. 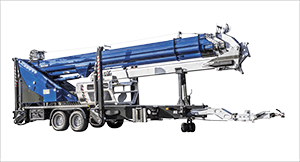 Our products offer you a reliable and adaptable solution whenever you need to safely and efficiently lift large and bulky loads to significant heights. 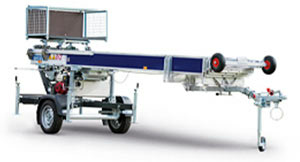 As the inventor of the mobile truck-mounted crane in an lightweight aluminium design and the aluminium trailer crane, we are particularly proud of our Böcker crane technology. 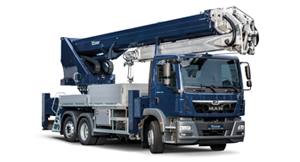 Besides having extension lengths of up to 55 metres and payloads of up to 12 tonnes, our truck-mounted cranes, trailer cranes and tracked cranes are characterised by extremely high safety standards, a comparatively low weight and compact dimensions. For example, it is easy to transport Böcker construction cranes from one job site to the next and set them up to be space-saving. 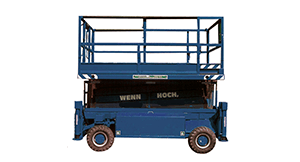 When it was launched, the first inclined lift with a knee joint from Böcker saved the roofing trade a tremendous amount of work. Even today, the trade can be seen to rely on the flexibility and long service life of the original. That said, heavy and bulky loads also need to be transported in furniture logistics and not only on construction sites. Böcker furniture lifts are equipped with hinged and swivelling furniture platforms and score highly with their low loading heights and resulting ease of use. Our powerful mast climbing platforms score highly because of their versatility, outstanding quality and high safety standards. Regardless of whether you transport people or just material, or are looking for a temporary solution for scaffolding work or a static solution as an industrial lift, our extensive and versatile range of rack and pinion technology is sure to have the right lift for you and your company. You will find in our range of high-quality ALP material lifts and personnel lifts perfect for lifting small loads, particularly for facade, maintenance, cleaning and installation work indoors and outdoors. Our ALP lifts can be transported by one person and set up quickly and safely, even in confined spaces. Purchasing a new product is not always possible or even necessary. This is something we are aware of at Böcker and why we offer you a large selection of perfectly maintained machines for hire. Simply send us your enquiry, and we will get back in touch wit you with an individual offer. Or perhaps you run a hire company yourself and are looking for reliable, high-quality and durable cranes, lifts and hoists for your construction equipment hire pool? If so, we look forward to receiving your enquiry.